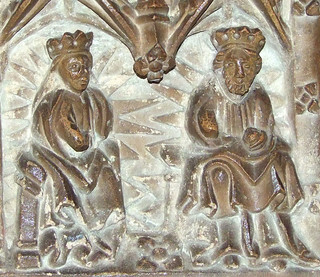 On January 8th, 1297, a royal wedding took place in Ipswich. Princess Elizabeth, daughter of King Edward I, married the Count of Holland. Fitch, in his annals, records that Edward I stayed in the town for the ceremony with 'a splendid court', and that the three minstrels were paid 50s each for their services.The wedding took place, not in any of the parish churches of the town, but in one of England's major shrines of Marian pilgrimage; a shrine to which we may presume Edward I had a special devotion. 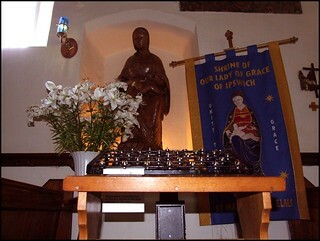 This was the Shrine of Our Lady of Grace, also referred to in contemporary records as Our Lady of Ipswich. This wedding is just the earliest record we have of a royal occasion at the shrine. Thereafter, a succession of visitors come here on pilgrimage, culminating in the early 16th century, when the pilgrimage cult was at its height. Between 1517 and 1522, both Henry VIII and Catherine of Aragon made journeys to the shrine, set beside the Westgate in the parish of St Matthew. Other visitors included the local dignitary Cardinal Wolsey, and the future saint Thomas More. It is hard for us to understand today the part that Mary played in the medieval economy of grace. Contrary to popular belief, there is considerable (and growing) evidence that the people of rural medieval England had an articulate and sophisticated understanding of the nature and purposes of intercessionary prayer. Although there may have been abuses, when people, in some sense, offered 'worship' to images of the Madonna, this was not a general practice, or even a common one. Mary was seen as a focus of prayer; contemporary images of medieval people frequently show them carrying their rosary beads. To have some understanding of the role of Our Lady in the hearts and minds of medieval Suffolkers, we need to look at the church in southern Europe today. The spectacular processions, the colourful images, the celebrations and devotions would all have been a part of medieval Suffolk life. Fundamentally, the people of medieval Suffolk, in all their daily trials and tribulations, in the midst of their suffering and expectation of an early death, saw Mary as being on their side. 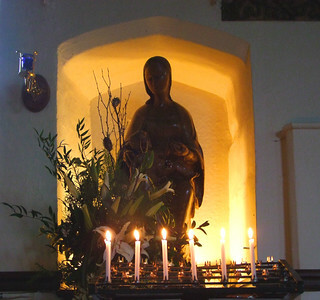 A surprising amount of evidence of the medieval affection for Mary survives in Suffolk, considering how this cult outraged the reformers of the 1540s, and was attacked by Puritans and Anglicans throughout the 17th and 18th centuries. A brief survey of churches with entries on this site will find the rosary dedication at the base of the tower at Helmingham, the Hail Mary monograms on each side of the tower at Stonham Parva, the so-called Doom painting at Cowlinge, where Mary tips the scales in favour of sinners, and many more. About half of the medieval churches in Suffolk are dedicated to St Mary. Although Nicholas Orme's seminal survey English Church Dedications has shown us that many current Anglican dedications are well-meaning 18th century inventions, will evidence proves that many of the Suffolk dedications to Mary are correct; except that the dedication would usually be to a Marian solemnity or devotion, most commonly the Assumption. This dedication has been restored correctly by the Anglo-catholics at Ufford. Of the churches not dedicated to Mary, all would have contained a Marian shrine. These shrines were most commonly at the east end of the south aisle, and were often restored by the Victorians as a 'lady chapel'. Some of these shrines became famous as a result of reports of their efficacy. Some became so popular that they were translated to buildings of their own. This is probably how the shrine of Our Lady of Grace came to be, although its actual origins are lost in the mists of time. There were four churches within a stones throw of the shrine, of which two, St Mary Elms and St Matthew, survive today. Edward I's visit to Ipswich came two hundred years after the founding of the greatest English Marian shrine at Walsingham, about sixty miles from Ipswich. We may assume that the fame of Ipswich grew in a similar way to that of Walsingham.There were other major shrines in Eastern England at Kings Lynn, Ely and Lincoln; in Suffolk, we know that pilgrimages were made to Bury, Woolpit and Sudbury, amongst others. 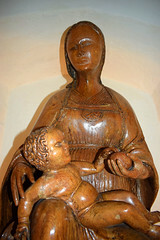 The fame and influence of the Ipswich shrine reached its peak in the early years of the 16th Century, after an incident known as the Miracle of the Maid of Ipswich. This occured in 1516 and was held in renown all over England in the few short years left before the Reformation intervened. The popularity of the Miracle, in which Joan, a young Ipswich girl, has a near-death encounter and experiences visions of the Virgin Mary, was widely used by the Catholic Church as a buttress against the murmurings of reformers. 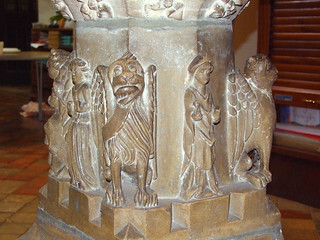 The late Dr John Blatchly, in his book The Miracles of Lady Lane showed convincingly that the font in nearby St Matthew's church was paid for by the Rector John Bailey to celebrate the Miracle of the Maid of Ipswich, and the visit to Ipswich of Henry VIII and Katherine of Aragon soon afterwards. The panels of the font depict events in the devotional story of Mary, mother of Jesus. These five reliefs, and a sixth of the Baptism of Christ, are amazing art objects. They show the Annunciation to the Blessed Virgin with Gabriel unfurling a banner from which a dove emerges to whisper in Mary's ear; The Adoration of the Magi, with the wise men pulling a blanket away from the Blessed Virgin and child as if to symbolise their revelation to the world; the Assumption of the Blessed Virgin, with Mary radiating glory in a mandala, which four angels use to convey her up to heaven in bodily form; the Coronation of the Queen of Heaven, the crowned figures of God the Father and God the Son placing a crown on the Blessed Virgin's head while the Dove of the Holy Spirit races down directly above her; and the Mother of God Enthroned, the crowned figure of the Blessed Virgin sitting on the left of and looking at (and thus paying homage to) her crowned son on the right, who is holding an orb. Dr Blatchly thought that the panel of the Mother of God Enthroned was a representation of Katherine of Aragon and her husband Henry VIII, which I think a little unlikely, although of course it could be both, one representing the other. Remarkably, two of the four figures around the base are probably intended as Joan, the Maid of Ipswich, and John Bailey the Rector himself. 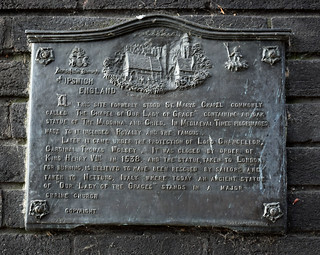 In The Miracles of Lady Lane, which Dr Blatchly co-authored with the historian Diarmaid MacCulloch, there is a fascinating if somewhat convoluted account of the battles between Bailey and Cardinal Wolsey, who was trying to consolidate his power in Ipswich by taking over the Shrine of Our Lady of Ipswich, which was in the parish of St Matthew. It is the kind of thing Trollope would have written about if he had been around in the 16th Century. Bailey's celebration of the Miracle was partly a way of competing with Wolsey for fame and influence, but Bailey's death in 1525 left the way open for the Cardinal, who in his turn would completely over-reach himself and fall in his own way. The book is memorable as a picture of the incredible religious fervour in Ipswich in the early years of the 16th Century, enthusiasms that would spill over into passion and violence. 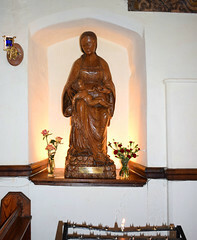 Blatchly notes that the sequence of at least some of the Marian images on the font was replicated by a sequence of inns down the mile of Ipswich's main street, now Carr Street, Tavern Street and Westgate Street, which led to the shrine. One of the inns, the Salutation (ie, Annunciation) at the start of Carr Street, survives in business under the same name to this day. But in time of course Ipswich would become well-known as the most puritan of towns in the most puritan of England's regions. The focus of any Marian shrine would be the statue of Mary, most often with the infant Christ on her knee. When the reformers of the 16th century set out to break the hold of the Church on the imagination of the people, statues of Mary and the saints were the first things to go. Poor William Dowsing, who inspected Suffolk churches for 'superstitious imagery' 100 years later in 1644, is often blamed for the destruction of these statues; but his meticulous journals do not suggest that a single one of them had survived to his time. The shrines were suppressed in the spring of 1538, and Sir Charles Wriothesley, in his Chronicle, writes that in the moneth of July, the images of Our Lady of Wallsingham and Ipswich were brought up to London with all the jewelles that hang about them, at the Kinge's commandment, and divers other images... because the people should use noe more idolatrye unto them, and they were burnt at Chelsey by my Lord Privy Seal. Wodderspoon, in his memorials, records that (Thomas) Cromwell... caused this image of Our Lady to be pulled down from her niche, and after despoiling the effigy of its rich habilements and jewels... it was conveyed to London and destroyed. 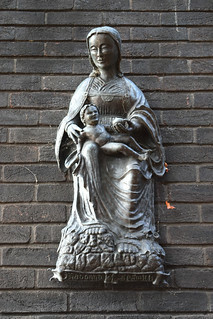 John Weever, writing a century after the event, reports that all the notable images, as the images of Our Lady of Walsingham, Ipswich, Worcester, the Lady of Wilsdon, the rood of grace of Our Lady of Boxley, and the image of the rood of St Saviour at Bermondsey, were brought up to London and burnt at Chelsey, at the commandment of the aforesaid Cromwell. This is a particularly folkloric account, since we know that several of the images mentioned were not burnt at Chelsea, but were destroyed elsewhere. There is no evidence that any of the surviving reports are by eye-witnesses, and although there are many other reports of the burning, all are circumstantial, and most seem to be based on Wriothesley's Chronicle. Stanley Smith, in his majestic The Madonna of Ipswich, concludes that the conflagration took place at Thomas Cromwell's house at Chelsea on 26th September 1538, under the orders of Bishop Latimer, and before the eyes of the Lord Privy Seal. The Ipswich statue certainly made it to Chelsea. Thomas Cromwell's steward wrote to him that he had received it, with 'nothing about her but two half shoes of silver'. This report will be crucial, as our story develops. In general, where a Marian shrine was not in a parish church, the building that had housed it did not survive for much longer. During the 17th and 18th centuries, several legal documents, especially those dealing with the transfer of ownership of land, make reference to the remains of the Shrine of Our Lady of Grace. John Waple bought land 'at the south end of the La. chapel wall' in 1566. In 1650, Edward Bartle was granted 'land on which once stood a chapel, called the Lady of Grace chapel, land whereon a stable is now built'. In 1761, a Mr Grove visiting from Richmond reports that 'there is scarce one stone left upon another'. Of course, the terrible irony of this is that we can use these land documents to pinpoint exactly where the shrine of Our Lady of Grace was. 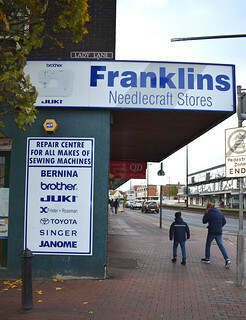 Another advantage to locating the shrine is that the general layout of streets in the centre of Ipswich has changed little since Saxon times, despite the best efforts of Sixties town planners. The shrine, then, was just outside the west gate of the town wall. This was demolished in 1782, but photographs exist of a rather fanciful reconstruction put up for the Jubilee celebrations of 1887. 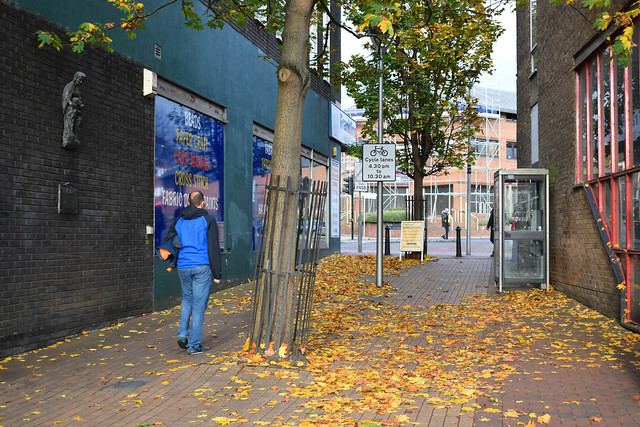 The gate stood in Westgate Street, just beyond where a footpath now cuts through to the Wolsey Theatre. The shrine stood on the next corner, where a Sixties block once housed a Tesco supermarket, but now contains a number of dismal discount stores. The narrow road to the left here is called Lady Lane, and was certainly called that in 1761, although I cannot discover if this name was contemporary with the shrine. We can also form some idea of what the shrine looked like. Stanley Smith records surviving wills which bequeathed items, including, in 1498, a porch and glass for the east and west windows. There was almost certainly a burial ground; this is referred to in a land transfer document and a will, and human remains were found on the site in the early 20th century. When Tesco was built in 1964, chunks of church masonry were discovered on the site; however, we should remember that, after the Reformation, rubble from many demolished religious buildings (of which Ipswich had plenty) were used in the construction of other buildings. What appears to be a pilgrim's token was also found near the site; but, as Stanley Smith points out, pilgrim's tokens from many shrines have been found around Walsingham, and there is no reason to believe that this particular medal originally came from Ipswich. 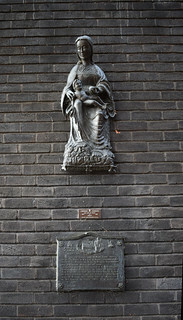 In Lady Lane itself, a small statue was put up in the early 1990s as a memorial to the shrine; it replaced a 1960s plaque. This statue repays close inspection, because the story gets slightly more exciting at this point. Despite the conflagration at Chelsea in 1538, there is some evidence that the statue of Our Lady of Grace survived, and still exists today; and that this memorial statue is a true copy of it. In the Italian city of Nettuno, most famous perhaps for its harbour of Anzio, there is a shrine to Our Lady of Grace. There is a story that the image there was brought to Nettuno from England during the Jubilee year of 1550. There is some evidence in the town archives to support this. And the town archives also mention Ipswich. It wouldn't be that improbable. Western mainland Europe is full of statues and sculptures produced in England during the 12th and 13th centuries. Many of them must have been exported at the time; Nottingham alabaster work, for instance, was greatly prized throughout Europe. But much probably went abroad at the time of the Reformation. It must be remembered that the Reformation in England placed quite a low priority on the new teachings of Luther and Calvin; they were the job of the theologians. But the state, which enforced the Reformation in England, was more concerned with wresting political power from the church, and enriching itself on the wealth of the churches, shrines and monasteries. It achieved both of these goals extremely successfully; the first is shown by the fact that there was no religious war in this country, and the second by the fact that the Tudor royal family amassed riches beyond its wildest dreams, much of it to be squandered by Elizabeth I and James I on high living and piratical expeditions to the 'New World'. There was no evangelical agenda on behalf of the English state as there would be 100 years later under Oliver Cromwell. It is hard to imagine William Dowsing selling images abroad, but there is a great amount of circumstantial evidence that the cronies of Thomas Cromwell and Thomas Cranmer in the 1530s and 1540s did exactly this. It was a pragmatic approach; they wanted rid of images, and they wanted to accrue the wealth of the church. That said, the Nettuno legend records that the statue was rescued from the flames by secretly Catholic sailors, who spirited it safely abroad. I think the sales story outlined above is more likely, though. The Nettuno image was identified as English as early as 1938 by an historian of 13th century iconography, Martin Gillett. He felt that considerable changes had been made to it; Mary's head had been replaced, and the posture of the infant Christ changed. The throne (no longer in existence) was a 19th century replacement. 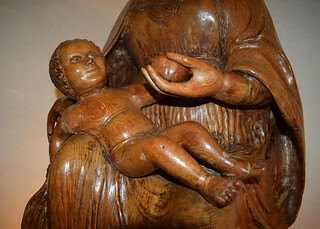 But the folds in the material, the features of the Christ child, the position of the infant on the right knee rather than the left, and the carving style, all strongly suggest an English origin. And then war intervened. Anzio and Nettuno were the site of some of the fiercest fighting during the Allied landings in Italy, and the statue was seriously damaged. During its restoration in 1959, an antiquated English inscription was found below the Madonna's right foot: IU? ARET GRATIOSUS (thou art gracious). This supports, as Stanley Smith says, the local dedication of Madonna della Grazie. The inscription had been overwritten SANCTA MARIA, ORA PRO NOBIS, probably in the late 16th century. Interestingly, no other major English Marian shrine was dedicated to Our Lady of Grace. Even more striking, when Martin Gillett first examined the statue in 1938, it was wearing two half shoes made of English silver, just like those described by Thomas Cromwell's steward 400 years before. Obviously, there is a great yearning for it to be true. I think, on balance, that the statue at Nettuno probably is the statue of Our Lady of Ipswich. Other people seem certain of the fact; hence the replica in Lady Lane. 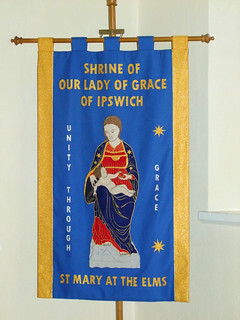 The Guild of Our Lady of Ipswich is an ecumenical group formed in the 1980s by people from the Catholic church of St Pancras and the Anglican church of St Mary Elms. They have re-established Marian shrines in both these churches, and meet monthly. They have also re-established the procession which Cardinal Wolsey instituted from St Peter (by his college) to the site of the shrine. They make this walk every year on the date of its predecessor, 7th September. Even more excitingly, they have also placed a replica of the Nettuno statue in the church at St Mary Elms. It was dedicated with great ecumenical ceremony under the watchful eye of the Guild in September 2002.